Architectural and scenic grandeur coincide at this spectacular Livingston stucco and stone estate, nestled on 2.27 manicured acres offering complete privacy and resort-like accommodations. Accessed by a circular courtyard and custom designed to offer every entertaining convenience, this 6-bedroom residence beautifully showcases impeccable attention to detail, designed to perfection by renowned local designer Tracey Butler. Not until now has a home so special entered the market that every other home feels ordinary in comparison. 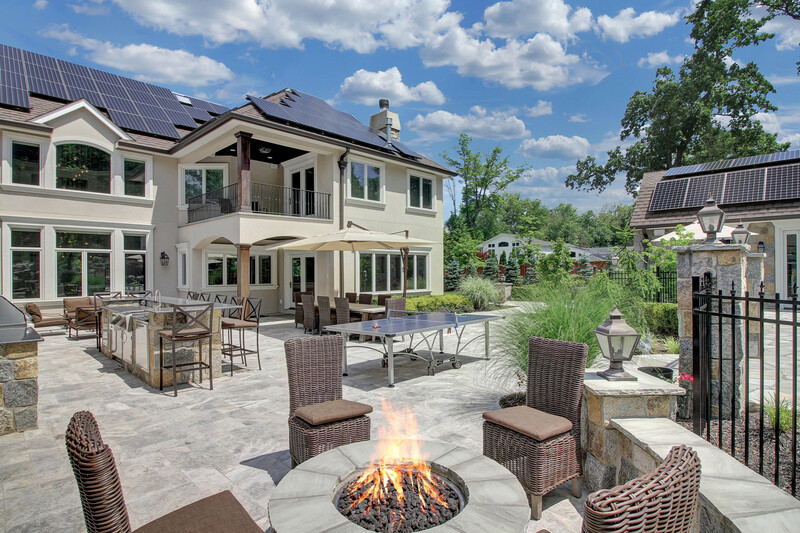 With unrivaled technology and elegant appointments, this suburban oasis literally has it all. Control4 home automation system for lighting, HVAC, blinds, surveillance cameras (28 in total) and sound/media (24 televisions all included), SunPower 58 kW ultra-high efficiency solar panels, uber-efficient geothermal heating/cooling, gourmet kitchen, state-of-the-art home theater with stunning beverage bar, expansive and dramatic first floor lounge with bar, full-size commercial gym and partially heated circular paver driveway. The expansive rear property rivals an exclusive resort boasting an outdoor kitchen, covered patio with TV and fireplace, free-form pool with waterfall and slide, cabana with kitchen and full bath on over 2 lush acres. 6 Bedrooms, 8 1/2 baths, 3 car garage, 4 fireplaces, grand open spaces, soaring ceilings, custom moldings and cherry hardwood flooring throughout, lounge with bar and seating, high-tech systems, state-of-the-art theater, whole-house generator, spectacular 2.27 acre property with heated in-ground salt water pool, 2 story cabana with kitchen and full blath, high-efficiency solar panels, geothermal heating & cooling and so much more. Vacationing away from home will be a distant memory. Entry to this magnificent home is accessed from a quiet street, through a set of front entry columns and circular drive, creating a commanding presence and promising no less. Peace and privacy abound in this idyllic setting, feeling far from the world yet only a few minutes from the center of Livingston. A portion of the paver drive leading from the street to the garage is heated, offering uninterupted use through all weather conditions. 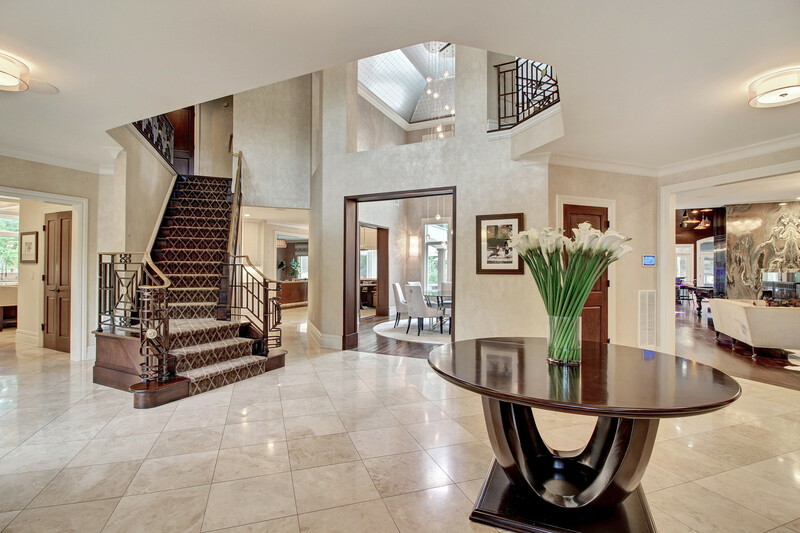 The impressive Entry Hall, with wrought iron staircase, custom doorways, marble flooring and soaring ceilings offers guests a glimpse of the grandeur that awaits every turn. Flanking the Entry Hall are an elegant fireside Living Room, first-floor office and banquet-sized two-story formal Dining Room boasting a dramatic chandelier, walls of windows and offering spaces that are perfect for both intimate gatherings and large events. Anchored on beautiful hardwood flooring and set beneath a high ceiling with beautiful moldings and architectural interest at every turn, the fireside formal Living Room is elegant, welcoming guests with warmth and grandeur. Off the Living Room, a custom Lounge with soaring ceilings, full-size bar, designer seating, custom built-ins and doors to the outdoor seating area is tucked away in a corner of the home for privacy and ease of entertaining. Attention to detail is evident at every turn, including herringbone pattern hardwood floors, thick moldings and designer lighting fixtures. Bright, cheerful and inviting, it is the perfect space in which to relax or entertain. A rare find in Livingston and a very special feature in this impressive home. A banquet-scale, two-story formal dining room with custom wallpaper and large bay window sets the tone for lavish entertaining under a dramatic tray ceiling and chandelier, offering the perfect space for both small and large dinner gatherings. Holidays and every day will offer a very special experience. At the very heart of the home is the spacious Kitchen with a wall of windows and connected to the family room, offering complete visibility to the resort-like rear property. The gourmet Kitchen is high-end, embellished with custom cabinetry, stone countertops, 36" Sub-Zero glass front refrigerator, 36" Sub-Zero freezer, Miele coffee/espresso maker, Miele microwave, Wolf 60" dual-fuel range with two electric ovens, 2 Bosch dishwashers, Wolf electric wall oven, Ariston combination washer and dryer, Dual Sub-Zero refrigeration drawers, and oversized center island with seating and additional sink. The convenient Butler's Pantry features yet another beverage refrigerator, custom glass-paned cabinetry, and a walk-in pantry. Nearby is the epitome of effortless gathering: a large family room boasting a focal wood burning fireplace with custom mantle. The room features crown molding, a pair of French Doors that open to the rear property, multiple sun-drenched windows, built-in speakers and hardwood flooring. The room is also dressed with chic grasscloth wallpaper. The master suite is an oasis in and of itself. Walking from the main hall through a pair of French Doors, a vestibule ensures that the room is completely tucked away from the rest of the home. In this vestibule, homeowners are greeted with his and her closets outfitted with custom cabinetry, and a substantial master bath. Featuring only the finest marble, custom wood cabinetry, jetted tub, oversized walk-in shower, separate commode room and a built-in television, hotel rooms will always feel like a step below. Continuing on through the vestibule, the true piece de resistance is revealed. The bedroom's focal point is a floor to ceiling gas fireplace insert with marble surround. Also boasting automated shades, walls of windows, en-suite coffee center and a heated balcony, this master suite is sure to please even the most discerning of buyers. Four other bedrooms and a laundry center also reside on this level. 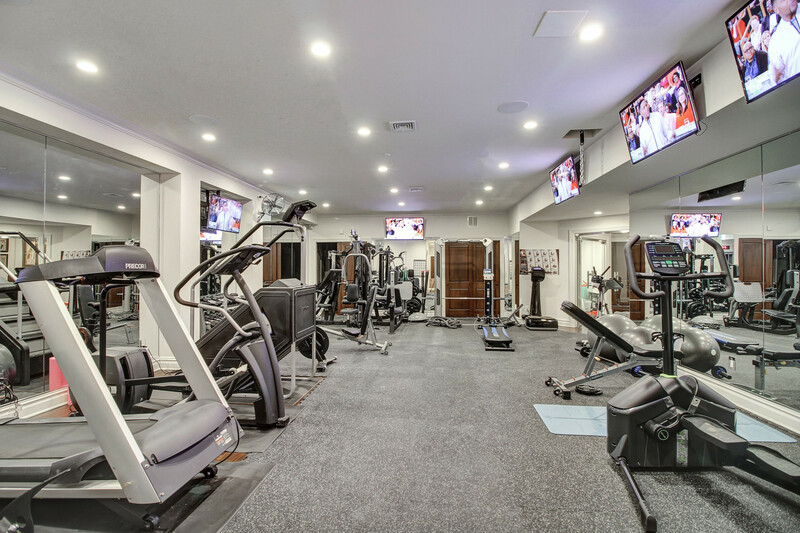 Down the stairs to the lower level, one will find one of the most elaborate home gyms to have hit the market. Including all of the essentials, such as rubber flooring and mirrored walls, this gym takes it a step further to include remote controlled fans and 6 wall-mounted televisions. Down a large hallway, the gym also boasts a dry sauna, wet sauna and full bath with custom vanity. Offering the ultimate in convenience and good health, gym memberships will be a thing of the past. 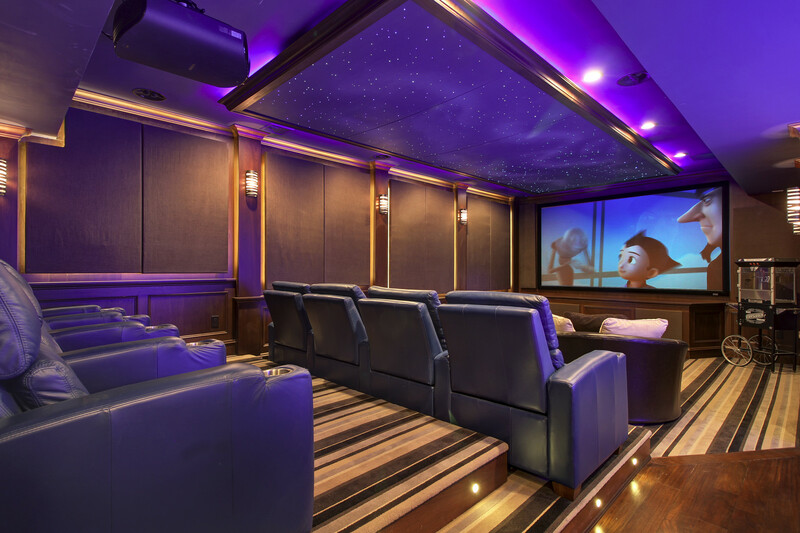 The state-of-the-art home theater is impressive and exceptionally comfortable, featuring a high-end home theater control system and Sony DLP projector, eight leather reclining chairs on three levels, handcrafted wood paneling, six custom wall sconces, sound deadening wall panels and luxurious carpeting. The ceiling is also outfitted with star ceiling panels offering a realistic starfield effect. 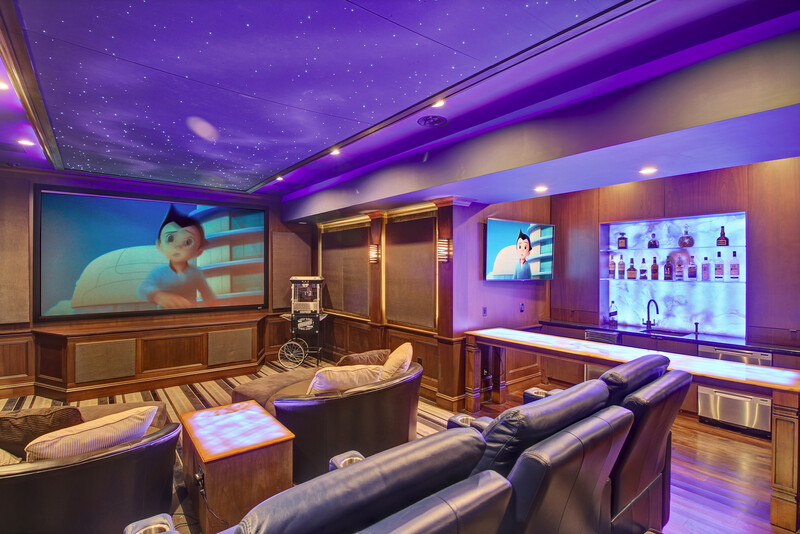 Continuing the theme of effortless entertaining, the home theater boasts a full wet-bar. Custom outfitted with inset wood cabinetry and a custom onyx countertop with lighting from below, this bar is unlike any other. The wet-bar also includes a Thermador microwave, U-Line wine refrigerator, Fisher & Paykel dishwasher drawers and a U-Line ice maker. The bar also includes another television so that everyone has a clear line of sight to whatever media is premiering on the projector screen. The grounds are breathtaking with expansive sweeping lawns and privacy all around. The custom terraces and patios across the rear of the property offer delightful views of the lush park-like property. From morning coffee to late night dinner parties, there isn’t a more perfect place to start or finish the day. The backyard is a stunning oasis. From the French doors in the first-floor lounge, one arrives at the outdoor covered patio. The area boasts yet another television screen and gas fireplace. 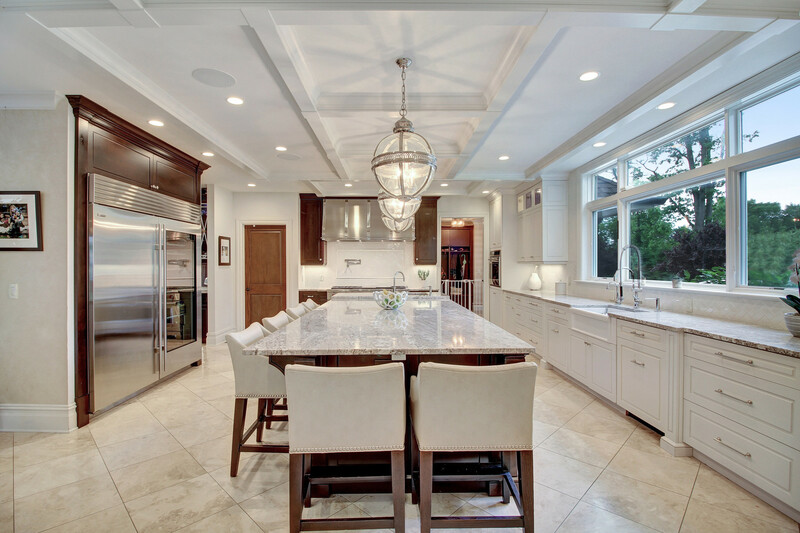 The ceilings are dramatic and include two oscillating fans and designer lighting fixture. The area also offers a beverage center complete with a beer tap and refrigeration unit. Nearby, one will find a standalone spa with an all-weather television. Completing the patio, the outdoor kitchen will please even the most discerning cook. Offering an oversized grill, outdoor burner, refrigeration center and full-size sink, summer cooking will be a pleasure. The area is also protected from the elements via a retractable awning which will guarantee use regardless of the weather. Nearby, a gas firepit offers cooler weather warmth and is certain to create the best smores in town. 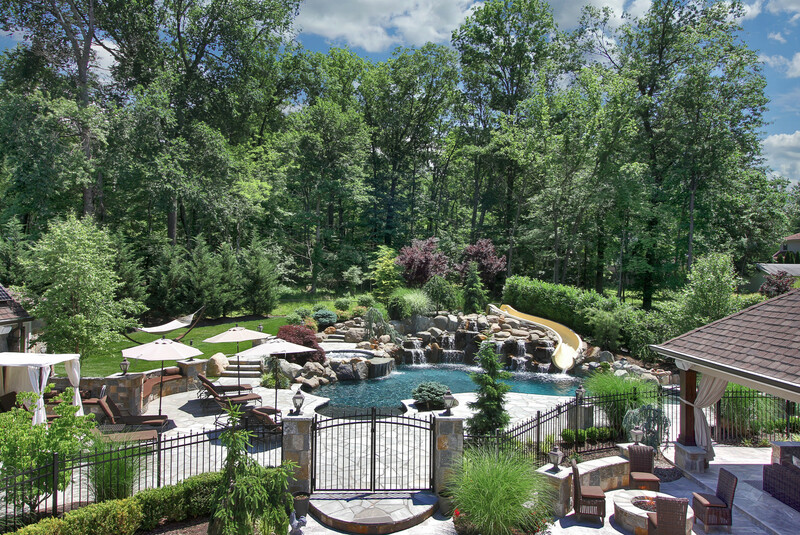 The piece de resistance of the backyard area is a custom gunite pool with salt water chlorination system. The pool boasts a built-in slide, waterfalls, two gas torches, spa and gas heater, all controlled by the Control4 system. Nearby a full cabana ensures convenience and easy entertaining. The two-story cabana includes a full bathroom, changing area, full kitchen with electric range, microwave hood, dishwasher and stackable washer & dryer. The second floor of the cabana offers yet another space for recreational use. 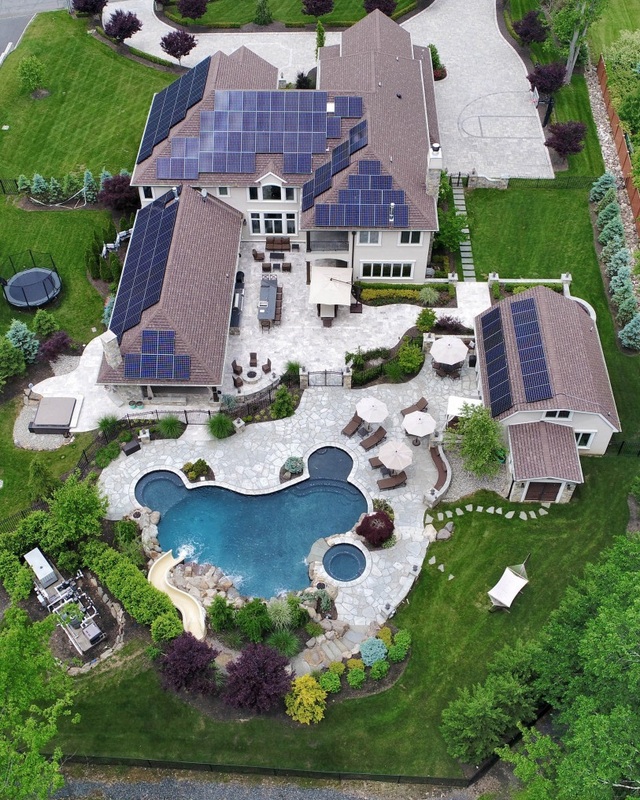 The technical systems are exactly what one would expect in a home of this caliber, with sophisticated state-of-the-art geothermal heating and cooling systems, 58 kW Sun Power Solar Panels, 24 televisions, security systems, sophisticated Control4 Home Automation System, automated blinds in many rooms and whole-house built-in natural gas generator. This estate awaits that extraordinary buyer who appreciates fine craftsmanship, beautiful finishes, leading-edge technology, a reduced carbon footprint and and all that Livingston has to offer.